Peter Tristram 09/10/13. "A while back Barry gave me this bloody nice little hybrid labelled T. cacticola x purpurea. I have never had cacticola self and rarely get pods on any forms (plenty of them!) using foreign pollen so I have no doubt the plant is as labelled. It is a very attractive plant and very hardy too, so, Barry, time to give the cross a name assuming the seedlings are all very similar. I’ll check for scent tomorrow. 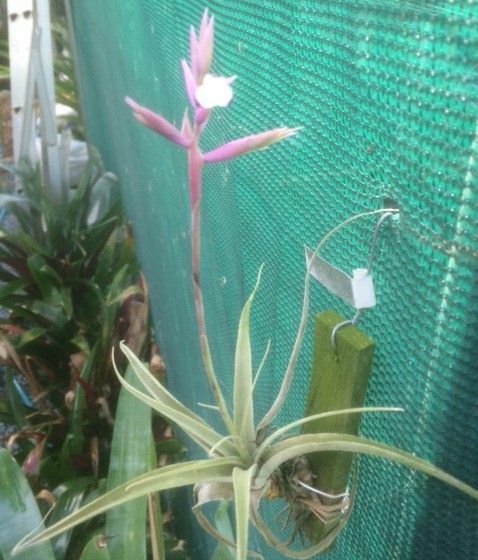 Also, a year or so ago I posted pics of T. straminea x duratii hybridised by Barrry – it needs a name too! More coming soon!" Barry Genn 16/10/13. "You are correct on both counts. On checking this cross it is actually the other way around purpurea x cacticola. I have also done purpurea x straminea, both producing very nice plants. The other thing that you mentioned which I believe is the major feature of this cross is that it is much easier to grow than cacticola, and that was the aim of this cross. I was thinking of calling it Min Min Lights." Derek Butcher 16/10/13. "Barry: What else needs to be added to the following? We can proceed with registering. At the moment I am not worrying about your purpurea x straminea because botanically these parents are very similar." 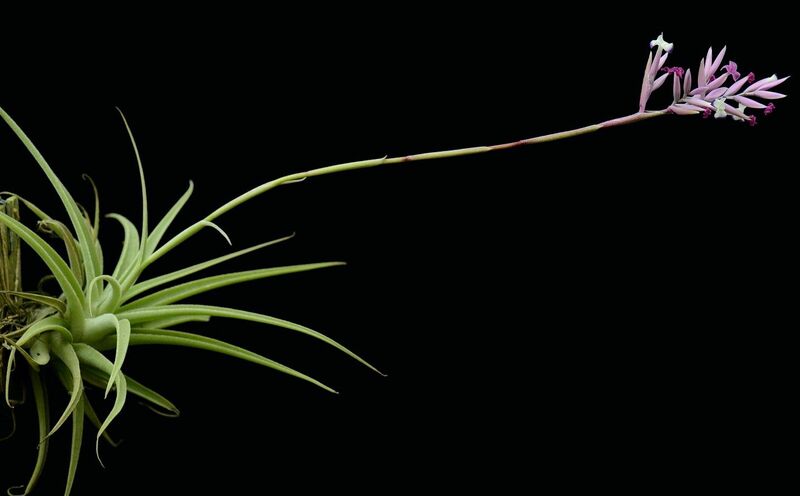 Tillandsia ‘Min Min Lights’. Breeder Genn B. Qld, early 1990. purpurea x cacticola. 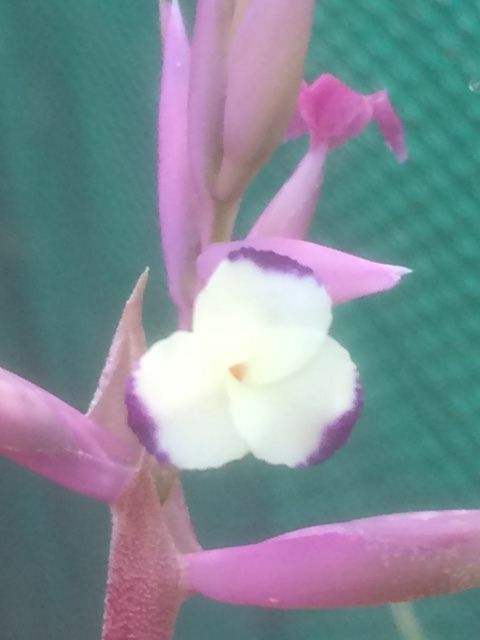 Scented, sometimes grown as cacticola x purpurea. Reg Doc 10/2013. Barry Genn 17/10/13. "The purpurea x cacticola cross was done April/2001. Yes I have plenty more to come but need to flower them first. I realize that purpurea and straminea are quite close botanically, but aren't they still regarded as separate species?" Peter Tristram 17/10/13. 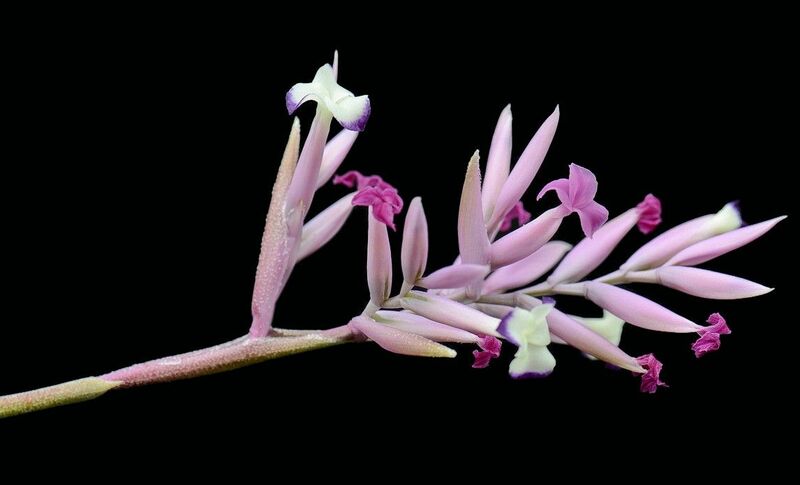 "In 2003 we saw plenty of succulent purpurea forms in the desert on the Peruvian coast, though we also saw long-caulescent forms at altitude (2500 m or more). It’s a scrambling terrestrial. We also saw cacticola and straminea together in the same trees - 3 very distinct species that’s for sure. The cacticola were in bloom and the straminea in seed. There are others in this group, like long-stemmed, cacticola type species, that don’t really fit in any of these. All of the distinctly cacticola plants I have and have ever seen are non-fragrant and have a more compact inflorescence; all of the purpurea have been relatively short-leafed, succulent, caulescent and fragrant with a rather strict inflorescence and all of the straminea have been short or long-caulescent with long-tapering, velvety leaves, laxly flowered inflorescent and fragrant flowers. Even the long stemmed cacticola types aren’t fragrant and aren’t as lax flowering as straminea. There is no doubt in my mind, BUT maybe there is really at least one other species, the caulescent cacticola!"